The Startup Olympics and After-Party at Club De Ville will benefit Austin-area charities. The Olympic Games have borne many legends – Jesse Owens, Mary Lou Retton, Michael Phelps, Eddie the Eagle, and the Jamaican Bobsled team, to name a few – all world-class athletic innovators in their respective sports. On Saturday, Jan. 21, a new league of innovative legends will emerge during the inaugural Austin Startup Olympics, a grueling 10-event competition featuring eight of Austin’s elite startups – Adlucent, Boundless Network, Build-a-Sign, Mass Relevance, SpareFoot, Spredfast, uShip, and Whale Shark Media. 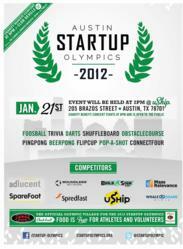 The Austin Startup Olympics start at 2 pm CST at uShip World Headquarters, 205 Brazos Street in downtown Austin (map). Media are welcome at this private event. The public is invited to an after-party for charity (see below). The five-hour event will determine Austin’s gold, silver and bronze winners in quintessential startup “sports,” including Ping Pong, Foosball, Beer Pong, Obstacle Course, Flip Cup, Pop-a-Shot, Darts, Shuffleboard, Connect Four and Trivia by Geeks Who Drink. Events resulting in ties will be settled with Rock-Paper-Scissors, in accordance with Austin Startup rules and bylaws. For more information on the competing companies and events, visit StartupOlympics.org. 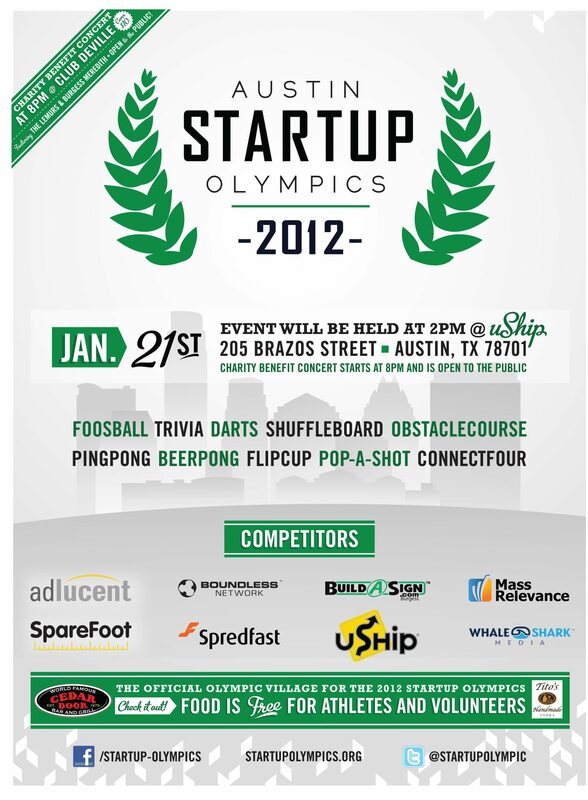 Follow the Startup Olympics on Twitter at Twitter.com/StartupOlympic. Competing companies are not only playing for pride but also for charity. Each has identified an organization to which winning money will be awarded. Charities chosen include Austin Children's Museum, Austin Pets Alive, Austin Pro Bono, Capital Area Food Bank, Communities in Schools of Central Texas, the Entrepreneurs Foundation of Central Texas , Kure It, and Livestrong/Lance Armstrong Foundation. Sponsors for the event include Tito’s Handmade Vodka and Cedar Door. Starting at 8 pm, participants invite the public to the Startup Olympics After-Party and Award Ceremony at Club De Ville (map). Bands performing at the after-party include The Lemurs and Burgess Meredith. All proceeds from the $10 cover charge will benefit local charities. In addition to throwing a post-Games party, Startup Olympics organizers are tossing out a challenge to other startups, particularly those in Silicon Valley, of which many will converge on Austin for the SXSW Interactive conference beginning March 9. Out-of-area startups are encouraged to bring their best to SXSWi for a friendly bout of competition at uShip. Interested companies should visit StartupOlympics.org for contact information. “Guys like Eddie the Eagle and the Jamaican Bobsled team were true innovators, giving their particular sports a new twist, a new look that made them legendary,” said Shawn Bose of uShip and co-Chair of the Austin Startup Olympics.